DISCONTINUED - This Zektor HDS4.2 Component Video Switcher switches one of four component video inputs to two component video mirrored outputs. This product has been discontinued by Zektor, please see these other similar component video switchers. This factory sealed Zektor HDS4.2 Component Video Switcher is capable of switching four sources of component video, digital audio (coax and optical), analog audio, and simutaneously outputing to two component video displays with both having the same input signal, all with the convenience of IR remote controllability. Its flexible inputs and passive switch contacts allow for switching of 5 wire video formats such as VGA (RGBHV), as well as reverse operation (1 source to 4 outputs). The HDS4.2 Component Video Switcher is using the proven passive switch design from the HDS4.1 an HDS4. It has 4 switches and adds a second buffered output capable of driving long cable runs for large home theaters. 4 Inputs, 2 Mirrored Outputs: Up to four sources of HD component video, and two mirrored outputs. One output is a passive pass-through; the second output is buffered with high speed amplifiers capable of the full HD bandwidth. Video performance at 37 MHz is -0.1dB on the passive output, and -0.1dB on the buffered output (avg. of all channels). -3dB bandwidth is over 100 MHz on both outputs. All Needed Inputs: Component Video, L/R Analog Audio, Digital Audio on Coax (SPDIF) / Optical Digital Audio (Toslink) is available on each input. 4-Input Selector Switches: These buttons allow direct selection of a desired input. It has an on/off switch, also. 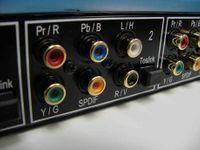 Analog Audio: The Left and Right Analog Audio inputs use the same passive design as the Component video inputs. This allows them to also be used for high bandwidth signals such as RGBHV or VGA (some adapters to RCA plugs would be needed). Digital Audio: Optical (Toslink) and Coax (SPDIF) are both automatically converted. When either input is active, both signals are available on the outputs. Remote Control Friendly: Controllable using any Universal Remote. Control the HDS4.2 Component Video Switcher using any universal remote by selecting from a small list of existing manufacturer command codes, or by teaching the Zektor HDS4.2 Component Video Switcher to use any unused buttons on your existing remote. There's no need to use a learning remote control (though the HDS4 will work fine with one); the HDS4 can be taught to use any unused buttons on your existing remote control. Remote Control interface allows: Power Toggle, Bright/Dim/Auto Display Modes, Direct Channel Selection, Channel Up, Channel Down and for better integration with universal remotes with macro capabilities Power On, and Power Off are also available. Auto Dimming Display: The LED indicator lights can be set to Bright, Dim, or Auto mode. Auto mode will fade the LEDs to half power after a channel is selected. Gold Plated Connectors used throughout design. The RS232 port is no longer available. Also see the Zektor HDS4.1 4X1 Component Video Switcher if you have only one HDTV. While there you probably need some new component video cables so see ours that are tested to pass 1080p. Why not buy this Zektor HDS4.2 Component Video Switcher today?